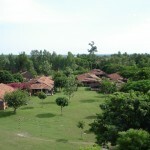 Lalgadh Leprosy Hospital and Services Centre (LLHSC) was built on land provided by the Government of Nepal that had previously been used for Army training exercises. 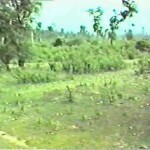 It was a scrubby piece of jungle, slightly elevated and next to the Ratu River. The elevation helps to allow breezes to blow across the site and keep it a little cooler in the hot summer period. The soil is sedimentary and being close to the river, is prone to erosion. 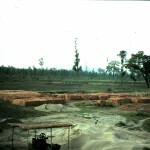 However, a number of gullies on the site were filled in making the 17 acre site fairly level in most parts. Site clearing began in 1989 and building started in 1990, taking about 6 years to complete at a cost to NLT of nearly £750,000. All of that money came through donations from concerned individuals and groups. Until that time, NLT had a small annual turnover of around £12,000, so the building of LLHSC is nothing short of a miracle. for treatment. 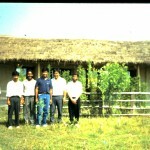 The patients were treated in a small bamboo and thatch temporary clinic (pictured here) and that continued to be the clinic for the next couple of years until the Outpatient Department became active. The In-patient buildings were amongst the later ones to be finished, and filled with patients rapidly once they opened. The in-patient capacity was set at 50 beds with a couple of extras to allow for the occasional general patient that we helped, and the beds have stayed full since they were commissioned with a fairly continuous occupancy rate of 98%. 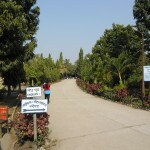 bordered with Ashok trees and flowers and draws patients up to the big tree in front of the Outpatients Department. 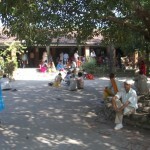 Those not able to sit in the waiting area, sit around in the shade under that tree. On a busy day, there may be over 800 patients visiting and so the tree is a valuable asset. Patients who are waiting for a while, or who have family members with them, often wander in the grounds or sit on the lawns to pass the time. The numbers of patients visiting has been increasing year by year, with almost 120,000 visits in 2017, so it does not seem likely that the work at LLHSC will decline any time soon. Apart from the Medical Director, Dr Graeme Clugston, all the staff at LLHSC are Nepali, with the occasional visitor from the West – often medical students on elective placements. Some of the Nepali staff were affected by leprosy themselves and first came as patients. They often make the best communicators of hope and encouragement to some of the deeply damaged people who come for help, having been thrown out of their home or village due to their leprosy. strong Christian ethos. Many visitors have commented on the deep commitment of the staff at LLHSC, many of whom (but not all) are Christians. Many of our patients have been deeply afected by rejection and loss, and find the caring atmosphere at LLHSC such a contrast to what they have known that they do not want to leave. Some literally have no place to go and have become semi-permanent residents – not in the wards but in other accommodation arranged for them. All of the leprosy services at LLHSC are provided free of charge and rely heavily on donations and support from individuals and organizations sympathetic with our work. with 1100-plus new cases of leprosy reporting each year and an extensive community programme innovated by Dr Hugh Cross. This community programme is active in the surrounding districts providing outreach services to people with leprosy, and carrying out many different development activities to lessen the stigma of leprosy. It has been encouraging to see attitudes changing in communities, enabling many of our patients to live much more fulfilling and integrated lives than they were able to before. This has only been possible through the tireless work of the staff at LLHSC and the support of many donors who have seen the value of the work and the transformation it has brought to individuals and whole villages. 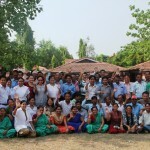 More than 20 years after its inception, and nearly 40 years after Eileen Lodge first envisioned a Leprosy Services Centre at Lalgadh, it remains an outstanding example of what a committed group of people can do when they join hands with a Faithful God, and steadily turn a vision – which many doubted – into a reality. Lalgadh has now treated well over 35,000 individuals with leprosy, many of those many times over, and has blessed many thousands more with good quality low cost general health services. Further thousands have benefited greatly from the community work which has a strong emphasis on stigma and poverty reduction, and health improvement, and also from its work improving whole villages and establishing self-help groups throughout its work area. Looking ahead, LLHSC aims to develop more of its general services and has recently increased ward capacity to facilitate this. It will be some time before additional services can be fully commissioned, but LLHSC already provides a range of dermatological treatment for over 100,000 general patients each year. This does earn a little money which helps support the leprosy work which cannot generate income itself. LLHSC will also increase its focus on disability in the future, as it has gained a lot of experience in this area through its extensive involvement in disability caused by leprosy, and this may benefit those with other kinds of disablity. In the meantime, the work continues to grow and faces many challenges. None of this would be even slightly possible without the support of its many friends, every one of whom plays a significant part. Do please consider supporting this excellent work and becoming a partner in transforming lives in a very real way.